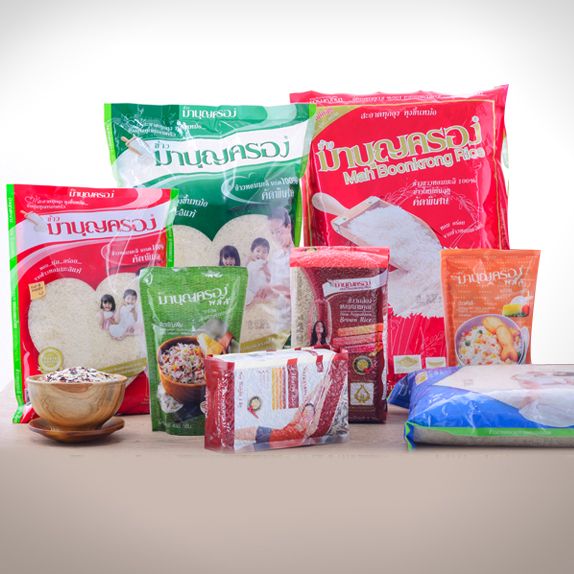 Business operation by Patum Rice Mill and Granary Public Company Limited (PRG) which is manufacturer and distributor of pre-packed rice under the brand of “Mah Boonkrong” and “Mah Boonkrong Plus” and registered capital stocks for company 900 million baht. Furthermore, the company has grown in both overseas and domestic markets and exports to over 40 countries worldwide. The company is the first pre-packed rice manufacturer in Thailand and the first rice manufacturer which received GMP certification. In addition, we are also the first and only one to received rice standard logo to certify special good Jasmine rice standard from Ministry of Commerce. Business customers group are divided into 4 groups according to the distribution channel. General customers group is consumer group who buy products through 4 distribution channels. Thai Hom Mali Rice 100%, new crop of special sort rice, size 5 kg. Grains Rice, Mah Boonkrong Plus brand, size 450 g.
Five Color Rice, Mah Boonkrong Plus brand, size 450 g.
Garlic Rice with Chinese Mushroom, Mah Boonkrong Plus brand, size 450 g.
Riceberry Rice, Mah Boonkrong Plus brand, size 1 kg. GABA Rice, Mah Boonkrong Plus brand, size 1 kg. 4 Hearty Rice, Mah Boonkrong Plus brand, size 1 kg. Organic Thai Hom Mali Rice Bran and Germ oil Nutra Oris 10, Mah Boonkrong Plus brand, packing size 60 capsules. Rice product packing size 15, 48, 49, and 50 kg. Rice production follows customer’s needs under the brand they want.